Here are few animations with fractals, built by IFS Builder 3d. While viewing these films, turn on "repeat" option in a video-player. Recommended resolution for stereofilms is 1024x768. They can be seen with the same method, as widely spread "the third eye" stereopictures: looking at the point behind the screen through the stereo-pair of images (one for the left eye and one for the right), you can get stereoeffect and see single three-dimensional object. The first our stereofilm. (540x240, 30fps, 6sec). 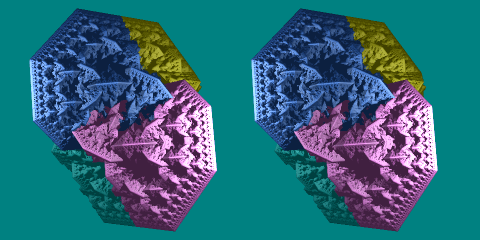 Stereofilm with Sierpinski's tetrahedron (480x240, 30fps, 12sec). The first our film with reflectivity. Four fractal trees stay on a mirror square. It's curiously that square is a selfsimilar set, generated by four similarities. Reflectivity in our program is a regular property of a fractal. So the whole scene is a single RIFS fractal, generated by 21 affine maps. Calculating time of this movie (320x240, 30fps, 12sec) is 1 hour 20 min on Athlon 1.4Ghz.. This "stone" with a thin fretwork is a one of the most difficult fractals to build. (480x240, 20fps, 9sec, calculating time is 5 hours). Construction speed is inversely proportional to size of pixel in a power of similarity dimension, which is equal to 4 for this fractal. For comparison, the similarity dimension of Sierpinski's tetrahedron equals 2, so construction time essentially differs. The flight around tree (500x400, 30fps, 12sec, calculating time 1 hour 40 min). This a zipped animation. It was compressed more then two times from initial size. The films themselves compressed by Microsoft Video 1 codec and can be easy viewed even on old computers. The Microsoft's codec was chosen as result of many tests. 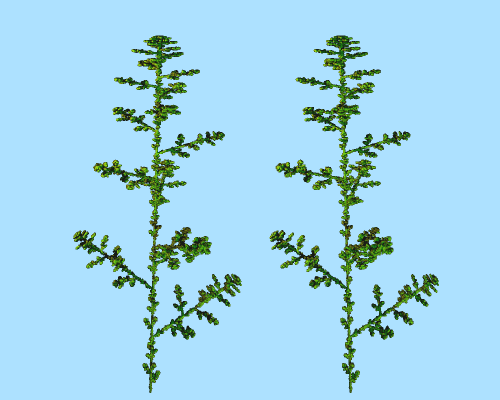 It is the single codec (on Windows platform) not reducing color quality, precision and legibility of fractal images.